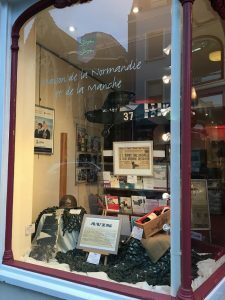 All summer, Normandy will be celebrating the 75th anniversary of the landings on its shores. 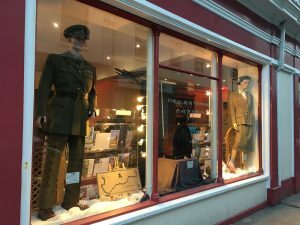 As part of the commemoration, la Maison de la Normandie et de la Manche has set up an exhibition with items from the Second World War in its shop windows. Many objects shown in this display were collected by Mr Olina Dumetz who was requisitioned to pilot the boat that supplied the island of Jersey from Granville (Manche) during the German occupation. 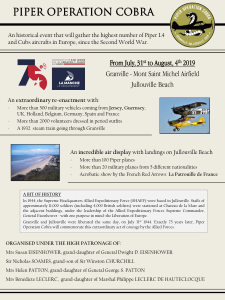 Pre-book your Manche Iles Express tickets with us at Maison de la Normandie to see this exceptional air display on the 4th of August. 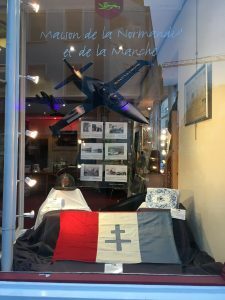 Thank you to our partners who helped us create this display: Mr Jean-Louis Dumetz who lent us some personal items collected by his grand-father, and Le Mémorial de Caen. ← Newsletter April 2019 – What’s on in Normandy?